Join Request and Join Accept messages are visible in the gateway live display. Join Accept does not appear to make it to the mDot. mDot log and configuration attached. Wireshark shows UDP traffic from GW to LoRaServer, but no UDP traffic from LoRaServer to the GW. Attached is the LoRaServer log. It clearly shows receipt of the Join Request and the successful Join Accept downlink being published to the gateway topic. Question, the last line of this log, the gatewaybridge confirming receipt of the Join Accept downlink … is this the last log message I will see if the gateway bridge issued the UDP response to the GW? Or is there a missing “downlink transmitted” log entry? I am trying to determine if the gateway bridge logic did in fact send the UDP downlink. What sort of gateway are you using? Can you get a shell on it to examine the situation? Is the packet forwarder running on a server and not on the gateway? If so could there be an IP firewall issue? Can you see anything from the packet forwarder itself in /var/log/syslog? If you can build the packet forwarder from source, can you add more logging? Does your gateway’s concentrator have a TX LED or signal you can monitor with a scope? Is the frequency plan correct everywhere? If you feel like picking up an RTL-SDR dongle, those can typically see nearby LoRa transmissions happen, especially if you constrain the node to a single frequency and then park their limited (2 MHz) bandwidth on the corresponding downlink channel. 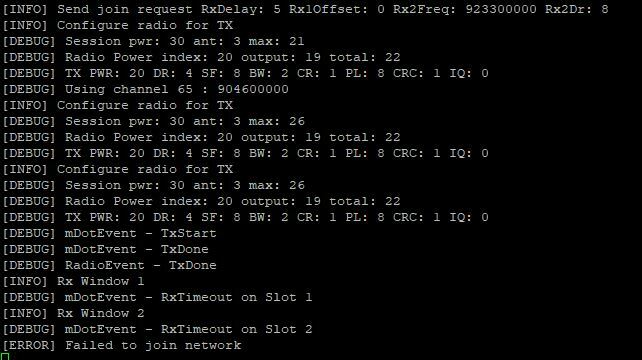 Or if you can get both the uplink and thus downlink frequency and the spreading factor consistent, you can use a spare node class radio with firmware to continuously receive, rather than only during windows. if you were really close, a diode power detector can probably see a gateway transmit; but monitoring the power drawn may not, since the receiver is also pretty power hungry. you can also publish your own MQTT transmit requests to a gateway, using immediate mode, if you want to see if it honors those in testing.